Sparrow In Flight: I'm Thinking About Ruffles! I was so excited when this particular blog was announced as I believe this themes was something I could definitely tackle. My daughter loves everything to be festooned with ruffles, shiny bits, pink and obtain perfect twirl-ability. I decided I would go with a dress for this venture. This fabric was purchased last year for Miss Z's First birthday dress after I successfully completely her first Christmas dress (HERE). 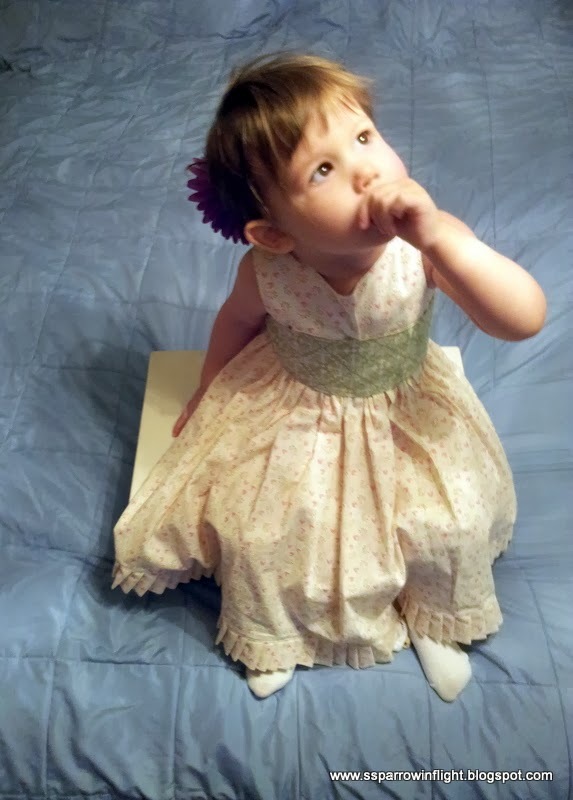 She has certainly grown since then, so I set out to make her an Easter Dress, salvaging some of the pieces I had begun! 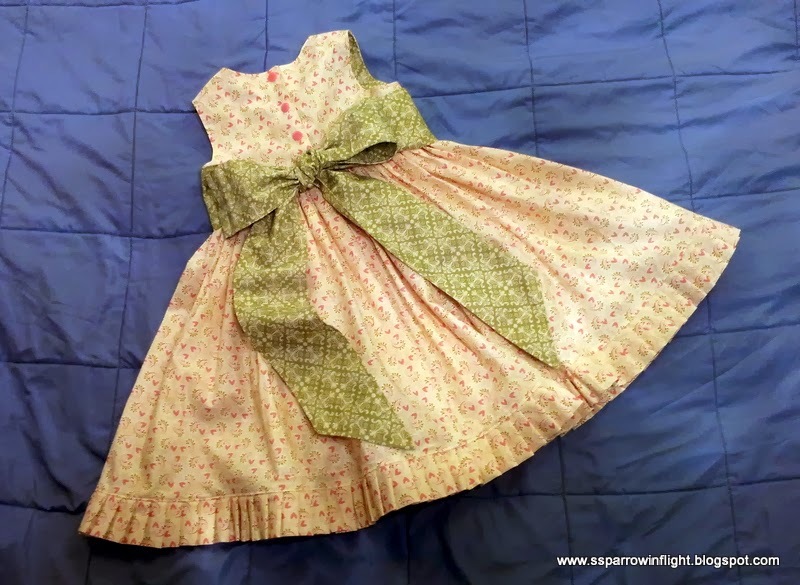 I adapted this dress from The Cottage Mama's Party Dress pattern (free tutorial found HERE). The changes that I made from the original was to lengthen the skirt, add the ruffles, and use snaps instead of the loop button closures. I also added a little bit more fabric in the skirt width to allow for more twirling, which is a favorite activity in our household. Thank you so much for stopping by on my stop on this Blog hop, please take the time to check out the other projects being featured today at the links at the top of this post! It is just adorable. The perfect little ruffles around the edge and the bow around the middle are just beautiful, but not compared to your little model. Oh, if my babies could still wear clothes like that. Just precious! I've had my eye on this pattern; your version is lovely! I love the changes you made, and your model is adorable in it!! That dress is so very sweet! That's the most adorable dress! And the model is just so cute! What a beautiful dress, makes me want to be young again! Thank you for sharing. How beautiful they both are! Thank you for the link! You have sewn a beautiful dress for a beautiful little girl. Thank you for sharing your creativity. Beautiful Dress - Beautiful model! You did a WONDERFUL dress, waouh, great! Love it!! The drew sis just perfect, I wish I still had a small daughter to make something similar. Thanks for sharing. I love a little girl in a ruffled dress. Yours is beautiful!!! Nice job. That's the sweetest little dress I've ever seen; great job! ohhhh so pretty…what a lovely dress and model too….ohhh I fancy this with all the joy I can ….adorable. She is adorable in that gorgeous dress...love it! Oh, my goodness! That sweet little girl in her sweet little ruffled dress is enough to make me want to have another baby! (Don't worry, I'm too old! I had three sons, so I never got to do the ruffly thing when they were little.) I love the pleated ruffles! What a beautiful dress in a beautiful girl! Great work! Thanks for sharing! Ohhhhhhhhhh she is adorable in her pretty little ruffled dress! What a beautiful little dress, and darling little girl! Great job. Wow what a sweet dress and Miss Z looks Devine in it!! The dress is wonderful! Love the colors and the waistband and the ruffles at the bottom are perfect! Beautiful dress for a beautiful little lady! So sweet. This dress is adorable, and your little girl is just beautiful. This is just the sweetest dress and your little one looks so adorable in it. You did good. That dress is precious. Congratulations on being in top two today. beautiful dress. I love that ruffle on the bottom. The dress is gorgeous. I used to sew all of my daughter's dresses when they were little. The colors you chose are lovely and such a cute model. Ruffles and pleats - gorgeous dress! And a beautiful little model. FABULOUS!!! Love the addition of the ruffles, Perfect little girl dress. Shanna, what a lovely dress for a beautiful child. I can just see her twirling about and getting that skirt and bow flying! Big smile. What a beautiful job you did on that little dress! I love that you lined the bodice with the contrasting color. When my granddaughters were small I made them several Daisy Kingdom patterns and they all had the big poofy skirts. What fun! Hope to see more in the future! The dress is gorgeous!! Wow!!! This is just as charming as can be! She is beautiful...and that little dress is simply lovely and charming...perfect JOB! I love a long dress on a little girl. So sweet! The dress will be perfect for Easter! A beautiful dress on a gorgeous model. What a perfect project for a ruffle hop. Love the colors. What a beautiful dress for Easter. And such a perfect model.What fun you are going to have. I loved sewing for little girls. That dress is too adorable for words. She looks precious in it. Shanna- that dress is beautiful and your little model most precious! So very sweet! That is a glorious dress! So beautiful on your beautiful daughter! I used to make little girlie dresses for my 3 daughters when they were young. Can't wait to start making them for my first granddaughter (she's only 2 months old, so I've got some time). Congratulations on being featured on Madame Samm's blog today. That dress is a winner! So so pretty. It's a darling dress for a sweet little girl. Oh my heavens, this makes me very much want to twirl around and around in my living room! I wonder what my husband would think? lol Thank you for sharing this little dress, it's very sweet and so is your little girl! Oh Shanna, this is just gorgeous! It definitely deserved a top spot for today. Little Miss Z looks precious in it too. Absolutely adorable! That is both the dress and Miss Z!! You did a fabulous job on it and I love the twirly skirt, the ruffles, and the big bow. Fab! Beautiful dress! But the model is so very sweet and what a great picture. The dress is absolutely stunning! Every detail is perfection. Miss Z looks fabulous in it ... she's adorable. Beautiful job on the little dress -- really really cute!!! Best use of ruffles yet! Miss Z looks so precious in her ruffled dress. It brings back fond memories of when my little Miss (who is now 27) wore ruffled dresses I made for her, and always with a matching bow for her hair. Great job! Beautiful dress. and what a sweet little girl. Just lovely. Oh such a pretty yellow dress for such a pretty girl. Priceless, absolutely priceless. I can't wait to have a Grand to make cute things for. You did a fabulous job. There is nothing more fun that a twirly skirt on a little girl! What a sweetheart! The fabrics are so pretty. That dress is so pretty and your model is adorable. Cuteness all around! Very pretty little dress, and perfect for your little girl. beautiful dress on a beautiful little darling! Thank you for sharing ... great job! What an absolutely charming dress for an even more charming twirler. Beautiful. And a big bow, to boot. You know, when you think about it, a gathered skirt is just a giant ruffle! What an adorable dress with an adorable little girl, I just love it. This is a very beautiful dress and you're daughter is so precious! Enjoy making fun things for her. Well, hands down.. your daughter is the star of this show but that dress is gorgeous! This is so, so sweet. 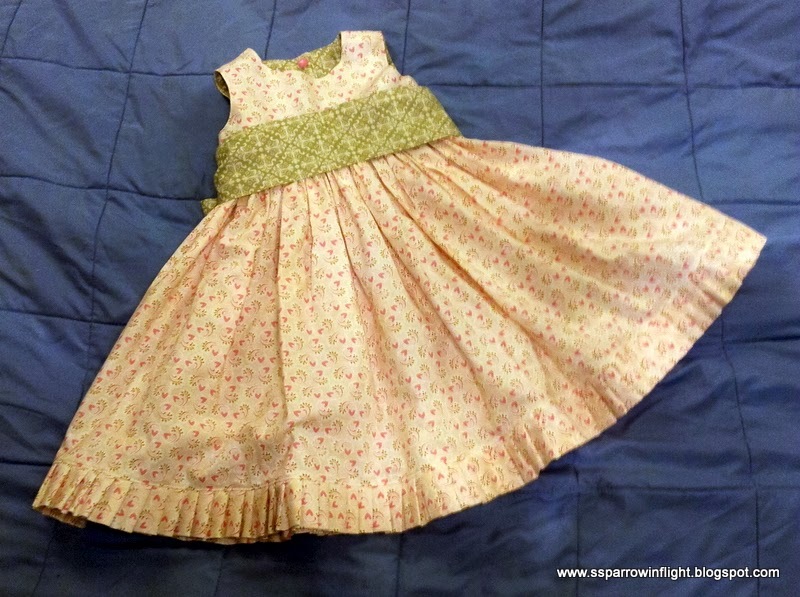 I enjoyed sewing dresses for my daughters when they were little, lots of gathers back then. Only one had ruffles on it. Miss Z is a dolly. Those eyes are beautiful. I can't tell if she is sucking her thumb or not. My daughter had to have a dental panoramic x-ray. After the technician left the room, my daughter, a thumb sucker for years and years and years, put her thumb in her mouth. She was probably about six at the time. The dentist came into talk to us, the parents, and was laughing about it. No one told her not to put her thumb in there, so she did. The dress is adorable. Mdme Sam is absolutely right about a big girl dress. I've lost about 55 pounds and I'm not particularly fond of what appears to be the trend of sleeveless dresses. I'm wondering if I couldn't put some plain short sleeves in a dress and make a plain short sleeved dress with a ruffle on the hem and cumberband type sash or bow at the waist. Wouldn't that be an adorable Easter dress - even or a "mature" lady in her early 60's? I have a 7-month old granddaughter that I've only seen twice. Once my son gets visitation set, I'll be a little more inclined to start sewing for her and then there may be ruffles, ruffles, ruffles in her life. I was thinking about something ruffly for my 12 year old step granddaughter for Easter. She got caught today having stolen and hidden her mom's cigarettes. So, grandparents have been asked to help with the punishment by no presents for Easter, birthday, etc. until the grounding period is over. Mom is MAD! Thanks for participating in the hop and being a great inspiration, helping me have great memories of dresses my mother made me, ones I made my daughter, and a ideas for others. Hope to see you in more hops very, very soon.